Single variety flowers ... super-casual look rather than curated. 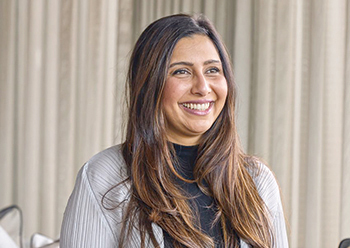 Founder and director of luxury design studio Elicyon CHARU GANDHI shares her insights into key trends and features for the world of interiors in 2019. Founder and director of Elicyon Charu Gandhi cites the examples of the furniture and interior accessories lines by Louis Vuitton and developing furniture collections by Missoni and Bottega Veneta. “This diffusion really comes alive with collaborations marrying the two, for example Karl Lagerfeld x Christofle,” she says. Gandhi ... fashion and interior design boundaries becoming less defined. • Stone: Elicyon predicts that polished marbles are about to be replaced with more tactile stones. Finishes such as honed, brushed, tumbled, flamed, leathered and sandblasted are slowly replacing the shiny polished look that we are used to seeing. 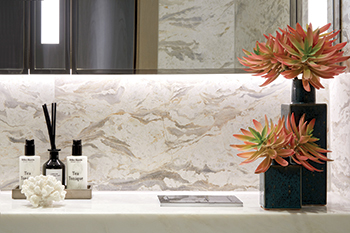 The studio also thinks that more tactile stone types such as limestone are rapidly gaining ground. • Flower arrangements: The recent wild and hand-picked style of flower arrangements are being replaced with large bunches of foliage and/or single variety flowers. “The idea is for them to look super-casual rather than curated,” she says. • Colours: After years of grey being the ‘on-trend’ colour in all of its shades, beige is back in favour. “And not the safe greige kind – full-on warm creamy beige. It takes a bit of getting used to but it adds a lovely warmth to an interior,” Gandhi points out. Lime green and yellow are noticeably prevalent in Elicyon colour palettes. “Zesty, full of pigment and engaging, they are increasingly available in the new fabric ranges being released by the suppliers we work with,” she adds. Generally, Gandhi says, the studio is continuing to explore and study how multiple colours and pigments come together in the context of the space they occupy. “Colour is greatly influenced by the light that it reflects, so we always take into account site specifics. Moving away from interior themes that champion a single ‘pop’ colour, we are bringing projects to life that interweave several colours with strong impact and personality,” she explains. • Window dressing: Elicyon sees curtains being increasingly replaced by Roman blinds. Elaborating on the reason for this trend, she says: “The idea is for the window treatment to take a back seat rather than centre stage – to naturally blend in and be beautifully constructed, sleek and practical. Other trends include “folk and gypsy” and a retro twist interior fit-outs. “Think Shaman motifs and gypsy-inspired embroidery: this weaves an air of intrigue into the design concept alongside powerful symbolism. This was seen recently with the eagle light from Klove Studio in its new collection launched at Dubai Design Week. “We are also noticing detail coming through in ruffles, borders and fringes with a 70s revival as a theme, whether in the colour or the pattern on the borders,” she concludes. Founded in 2015, Elicyon offers turnkey residential interior design, interior architecture, project management and furniture design services for private individuals and property developers. Its recent projects include two show apartments at One The Palm, Dubai, show apartments at Ronson Capital Partners’ Chiltern Place in Marylebone, an apartment in Shanghai’s Pudong district featuring only British design, and a four-bed park facing apartment in One Hyde Park.